If you want to charge with 30A charger 7.2kW, you must get the SEL model, SE model only supports 3.6kW or buy one with 7.2kW option. SE standard is 3.6kW. We’ve had our 2015 e-Golf for over a year now and we’ve been using the original portable charger from the car. Sometimes we came home late, the battery went down to 30 miles and we charge our car after 9PM, it wouldn’t be full in the morning. We’ve been looking for an inexpensive level 2 charger for our car, all of the models seem to have the problem with the eGolf charging system. We took the car to get the firmware recall update and the charging system check, they replaced the charging cables and we didn’t have the 70 or 55 miles random full charges any more. 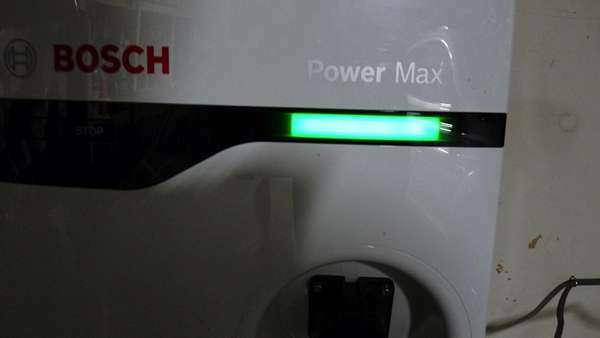 Luckily, we found a used Bosch Power Max EL-51253 30A 18FT cord level 2 charger for $225, we bought without testing since we have no 240V 40A power and connection to test. After reading and checking online, the only problem with people who want to install Level 2 charger is the outlet – It seems to cost a lot if you have to hire an electrician to do it, especially if your house is older like our house 1979. 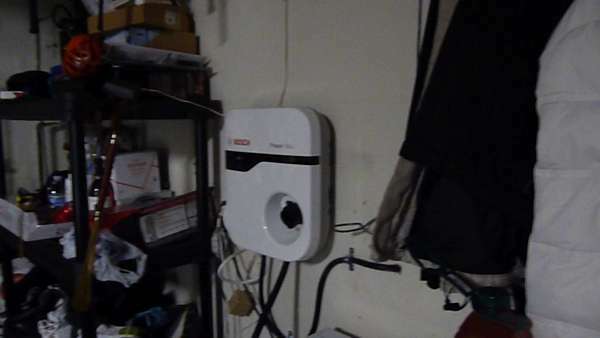 Every house should have a Dryer outlet which already is 240V 20-30A, most of the time the wires are already 10 gauge. Realistically, the 10 gauge can run up to 30A. Now the size of the wires are to determine how much current it can go through without getting too hot and burst into flame by melting their insulators. To be safe, people always want to use the most powerful wires for the job and also for reliability reasons. If our cables from the breaker to the outlet is short, and most of the breakers to the dryer outlet are, to me, I wouldn’t worry connecting a 30A EV charger with 10 gauge wires. Lowes has the bundle wires for $1.36/ft with great insulators material. We checked our cable while charging for an hour, the cable wasn’t even warm. We only needed 4 ft of 10 gauge 3 (black, white and green) to splice from the washer room to the garage. We use Gas dryer but we still want to have the outlet inside. The cost of installing this was very inexpensive, 40A double pole breaker =$16 and the 4ft 10 gauge + clamps =$10. 18FT cord is a little tight for a big garage, it barely makes our car if we park 2-3ft from the wall. The charging time is a little over 2 hours from 39 miles or 40% compares to 9 hrs with the original Level 1 portable charger.